On a crisp, beautiful December day, Dell Daniels drove to Emory Eye Center’s Perimeter location. Her eyes, once again, were tearing as she drove. She wasn’t crying—she had severe dry eye, which can cause abundant tears. Daniels was hoping that a new treatment would help her increasingly annoying symptoms. Because of her constant tearing, people often asked her if anything was wrong. Daniels reported that her eye “felt like it had sand in it,” she could not see well at night, and her eye continuously watered, which eliminated her wearing make-up altogether. Following cataract surgeries several years ago, then PRK and finally LASIK, she developed severe dry eye symptoms. 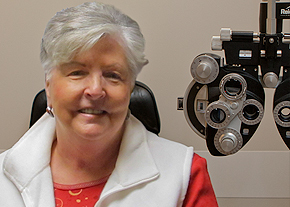 Frustrated with the quality of her vision, she sought help from Emory Eye Center. The physicians suggested a new treatment for Daniel’s particular type of dry eye. Emory Eye Center is the first academic center in Georgia to offer the new technology that can help patients who suffer from a certain type of dry eye syndrome. The technology, Lipiflow Thermal Pulsation™ is a novel way to treat evaporative dry eye disease caused by meibomian gland dysfunction (MGD). Opening and clearing the blocked oil glands allows the body to resume the natural production of lipids, which are needed for healthy tear film. The result may eliminate the uncomfortable symptoms associated with evaporative dry eye, which include light sensitivity, foreign body sensation, eye fatigue, and burning. The treatment generally takes approximately 12 minutes total for both eyes and may last from nine to 15 months. The procedure is fast, virtually painless and is an out-patient procedure, performed in the physician’s office. The LipiFlow Thermal Pulsation System applies heat to both inner eyelids, while at the same time applying gentle pressure to the outer eyelids causing release of lipid from the blocked meibomian glands. After her treatment, Daniels drove herself home. At her home in middle Georgia, she reports that she has no dry eye symptoms in her treated eye, and, further, that she would “highly recommend” the innovative treatment for others who have a severe dry eye problem.